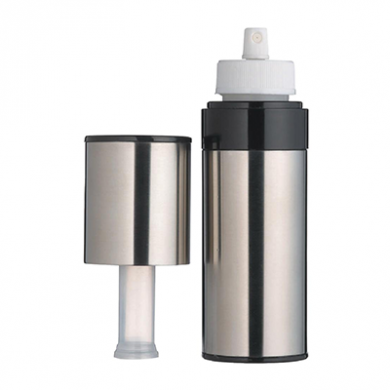 Stainless steel mist-spray bottle - ideal for applying a fine coating of oil. Pump action top to build pressure. Multi functional bottle can be used with water, cooking oils, vinegars, dressings (clear) and flavoured oils. Before use please wash all components in warm water. Half fill base container with chosen liquid (oil, water etc). (approx 2 fl oz / 50ml) Liquid should have no small pieces, to avoid any clogging. IMPORTANT: Do not over-fill container as this will stop your spray from working. Once base container is half full, replace your fine spray nozzle and tighten securely. With pump head on spray nozzle, pump five times or until resistance is experienced. The spray is now ready to use. Base container with nozzle and rim removed is top rack dishwasher safe. Hand wash only all other components. Clean thoroughly between refills ensuring clean water is sprayed through the nozzle to prevent blockages.